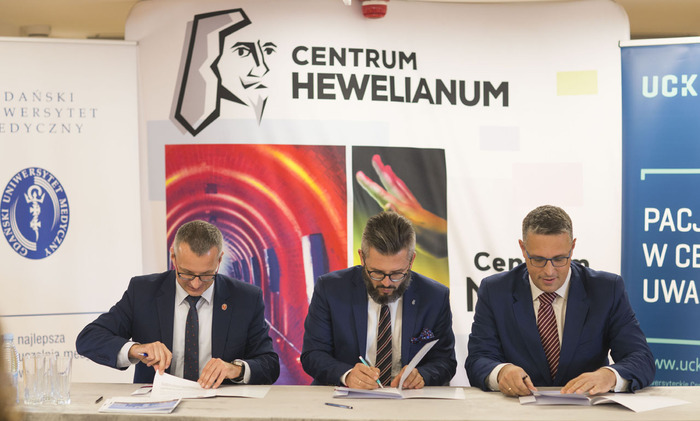 The Medical University of Gdańsk, University Clinical Centre and Hewelianum Centre started cooperation to popularize medical science. On October 10th prof. Marcin Gruchała, M.D., Ph. D. Rector of MUG, Jakub Kraszewski General Director of UCC, and Paweł Golak Director Hewelianum Centre signed an agreement about Pomeranian inhabitants health education. Hewelianum Centre has many years of experience in popularizing medical knowledge. Our educators are the interactive exhibition concept authors ON HEALTH, which shows how the human body works and promotes healthy lifestyle – mentioned Paweł Golak. Educational activities and popular science character are the mission of MUG. We have highly qualified scientific and didactic staff. Ours extremely active students who – despite many duties resulting from difficult studies – are able to sacrifice selflessly for another human being. The MUG is a modern medical school that has been educating in all medical professions over 70 years – said prof. Rector Marcin Gruchała, M.D., Ph.D.
“Patient in the spotlight” is the slogan that guides our actions. That is why we are even more happy to undertake this cooperation – added Jakub Kraszewski.